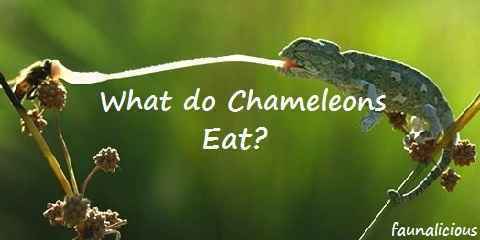 What do chameleons eat? Are they the herbivores, carnivores, or even omnivores? Do they feed on grasses or seeds? What is the best food they like the most? Before adopting a chameleon, you need to make sure that you have had a lot of information related to chameleon and how to handle them (see different species of chameleons). It includes the right diet to keep them healthy, the right maintenance to keep them away from pressure, and also how to grow them well. Here what you need to know related to the diet of chameleons and also their schedules. Based on some researches that have been conducted to chameleons, it has been figured out that chameleon has a wide range of diet which consists of crickets, katydids, cicadas, meal worms, cockroaches, night crawlers, king meal worms, pill bugs, grain beetles, house flies, caterpillars, earthworms, grasshoppers, grain beetles, and also wax worms. 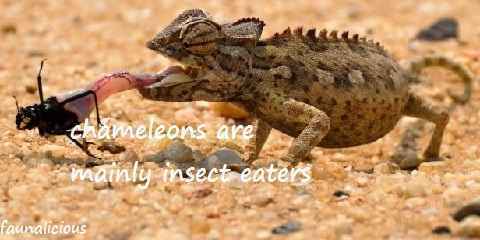 These insects that are supposed to be the diet of chameleons can be obtained from the insects’ feeder companies or some available pet stores. These companies will help you get the right diet that you need for your chameleons. A healthy chameleon needs proper amount of both phosphorous and also calcium with the ratio of 1:2. In fact, this amount that you need to provide for your chameleons is mostly unavailable in the pet stores. That is why some people prefer to add supplement so that their diet can still on track. For the feeding schedule, it is differentiated based on the age of your lovely pet (see how long do chameleons live?). A juvenile chameleon needs to be fed for about twice in a day. As it is very small in size, you need to categorize which one that suits for the juvenile chameleon to consume. This baby chameleon can’t stand eating big crickets. That is why it would turn out to be better when you choose the crickets in pin size since it is not too big for them to eat. It is just the right size for their feeding. For adult chameleon, you have to feed them every single day. Their diet can also change based on what you want to feed them. The idea of hanging some leafy greens for them can make them healthy too. The amount of every single feeding has no standard. You can give them a few insects then when they take it, probably the size of their plan isn’t enough. When you have provided them with more food and they aren’t attracted with it, it can be used as a sign that the amount of the feeding has been enough for them. You can have a wide range of food for your home pet as long as it is still in acceptable amount. To sum up all of this, you need to choose the right food for your chameleon and in the right amount for it. What about you? Have you figured out on what do chameleons eat and their schedule of feeding?